The bald eagle, the humpback whale, the grizzly bear, and hundreds of other species owe their survival to the Endangered Species Act — a landmark law that the Trump administration is trying to gut for the sake of corporate polluter profits. The proposed rollbacks would give the drilling, mining, and logging industries the green light to destroy fragile wildlife habitats and drive our most threatened species to the brink of extinction. Send a message now urging the Trump administration to reverse course and save the Endangered Species Act. The bald eagle, the humpback whale, the grizzly bear, and hundreds of other species owe their survival to the Endangered Species Act — a landmark law that the Trump administration is trying to gut. Send a message urging the Trump administration to save the Endangered Species Act. 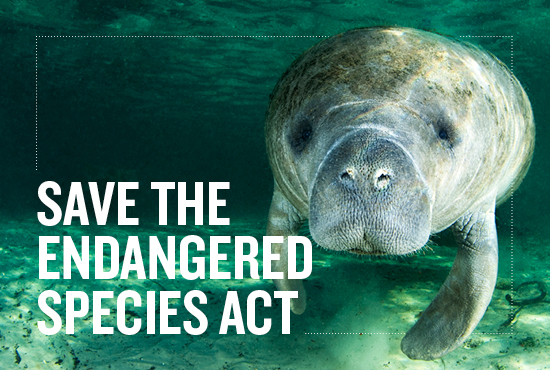 Dear President Trump, Secretary Bernhardt, and Secretary Ross: I am one of the 4 in 5 Americans who support the Endangered Species Act and do not want to see it gutted. I am outraged you are proposing to dramatically weaken the law that has helped bring countless imperiled species back from the brink of extinction. Without the ESA, we might not have the bald eagle, the manatee, the grizzly bear, the American gray wolf, or the American alligator, among many other species. I am especially troubled that the proposed changes will: *	Make it more difficult to extend protections to threatened species, delaying lifesaving action until a species' population is so small it may be challenging or impossible to save *	Exempt climate change from key parts of the law, making it more difficult to protect the polar bear, the bearded seal, and many other imperiled species that are impacted by the effects of climate change *	Allow economic factors to be analyzed when deciding if a species should be saved *	Make it easier for companies to build roads, pipelines, mines, and other industrial projects in critical habitat areas that are essential to imperiled species' survival Please reverse course and save the Endangered Species Act. Thank you.